Jean Muir for Jane & Jane, Butterick Home Catalog, Spring 1965. This summer, after extensive renovations, the National Museum of Scotland opened its new galleries, including a Fashion and Style gallery. Jean Muir’s archive is housed in the museum, so the new gallery returns this important collection of her work to public view. 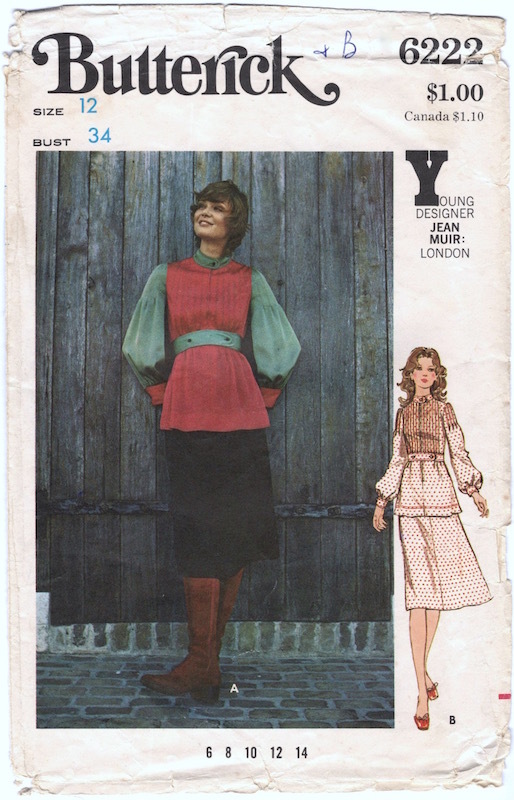 To celebrate, I’ll be posting a two-part series on Jean Muir sewing patterns. Box with slides from the Jean Muir Collection. Image: National Museum of Scotland. Though born in London, Jean Muir (1928-1995) is often called “the Scottish Chanel.” Muir began her career working at Liberty London. She was the designer for Jaeger before winning backing for her first label, Jane & Jane, in the early 1960s; she also designed for Morel London. 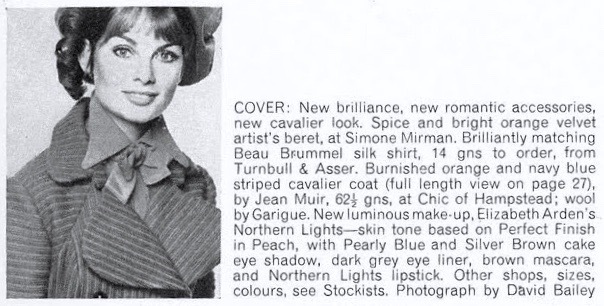 In the fall of 1966 she founded her own company, Jean Muir Ltd. Acclaimed for her precise cut in jersey, leather, and suede, she preferred to be called a dressmaker. Jaeger advertisement illustrated by René Gruau, 1957. Image: Jaeger.co.uk. 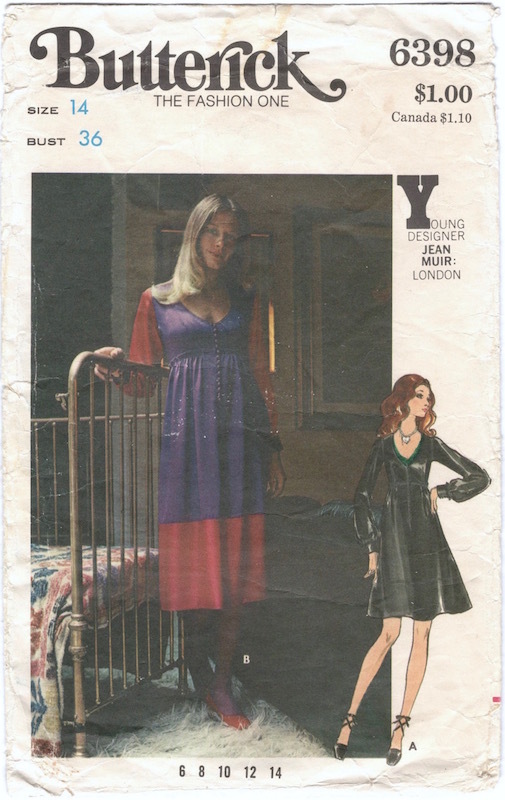 Muir and her designs are featured in Life magazine’s 1963 portfolio (headlined “Brash New Breed of British Designers”) on what was then called the Chelsea Look. 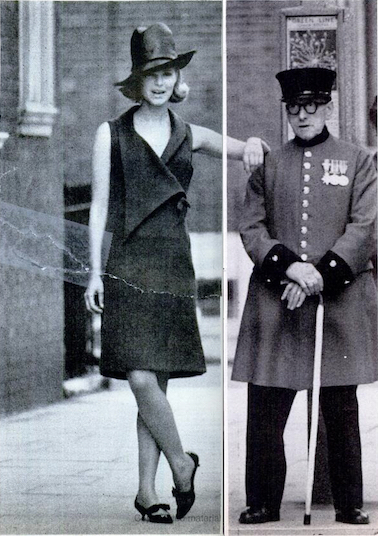 Jane & Jane “granny” dress at the Royal Hospital Chelsea, Life magazine, October 18, 1963. Photo: Norman Parkinson. Image: Google books. 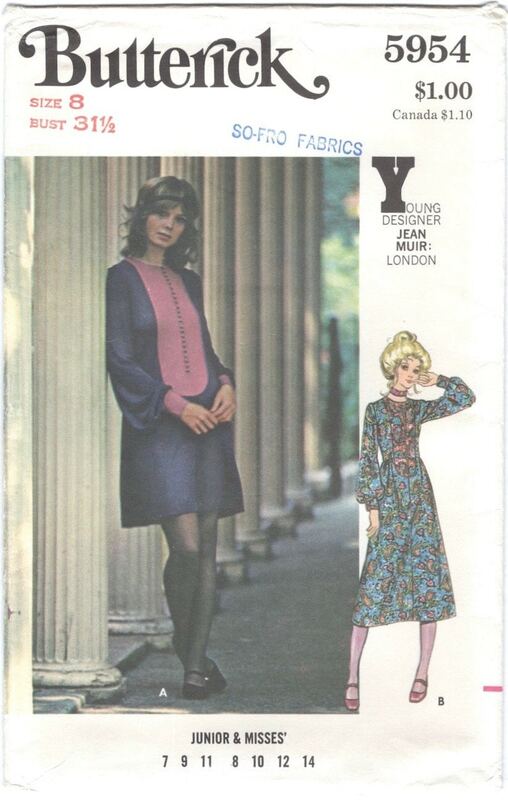 Jean Muir licensed patterns with Butterick’s Young Designers line into the early 1970s. 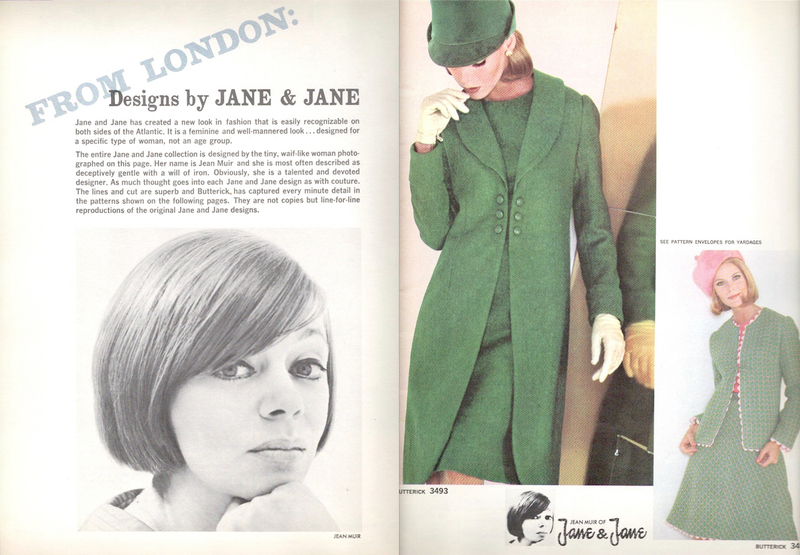 “From London: Designs by Jane & Jane,” Butterick Home Catalog, Spring 1965. Butterick 3495 and 3494 by Jean Muir for Jane & Jane, Butterick Home Catalog, Spring 1965. 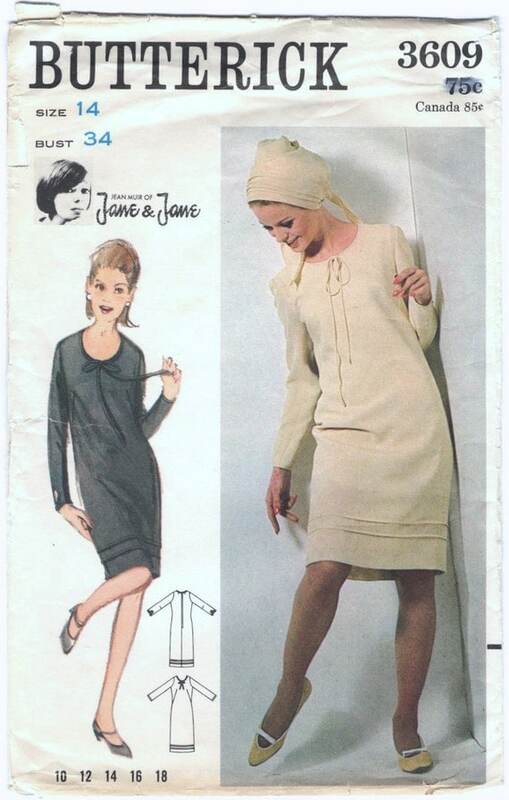 Butterick 3609 by Jean Muir of Jane & Jane (ca. 1965) Image: PatternVault on Etsy. Jane & Jane wool dress with secretary bird, British Vogue, February 1965. Photo: David Bailey. Model: Sue Murray. Image: Youthquakers. Butterick 3722 by Jean Muir of Jane & Jane (ca. 1965) Image: PatternVault on Etsy. 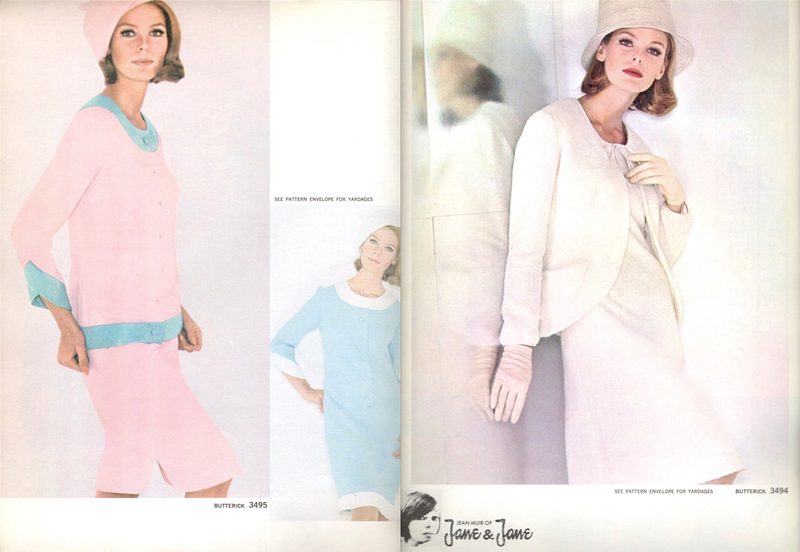 Jane & Jane dress in British Vogue, March 15, 1965. Photo: Eugene Vernier. Model: Grace Coddington. Image: Youthquakers. 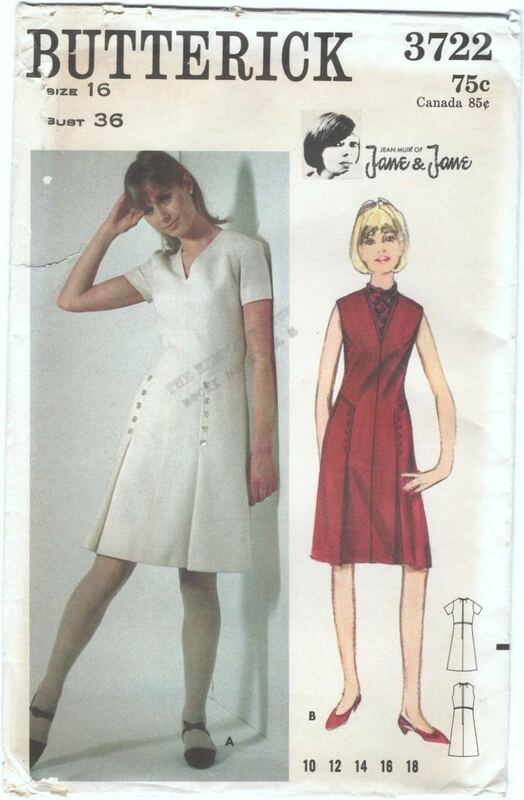 Butterick 4153 by Jean Muir of Jane & Jane (ca. 1966) Image: Vintage Patterns Wiki. Coat by Jean Muir, British Vogue, August 1967. Photo: David Bailey. Model: Jean Shrimpton. Image: Youthquakers. Burnished orange and navy blue striped cavalier coat in Garigue wool by Jean Muir, British Vogue, August 1967. Photo: David Bailey. Model: Jean Shrimpton. Image: Youthquakers. Butterick 5242 by Jean Muir (ca. 1969) Image: Serendipity Vintage. Butterick 4937 by Jean Muir on the cover of Butterick Fashion News, August 1968. Image: Vintage Patterns Wiki. Butterick 4937 by Jean Muir (ca. 1968) Image: Etsy. Jean Muir jumper in British Vogue, October 15, 1967. Photo: David Bailey. Model: Sue Murray. Image: Youthquakers. Jean Muir jersey dress, British Vogue, August 1969. Photo: David Montgomery. Model: Moyra Swan. Image: Youthquakers. 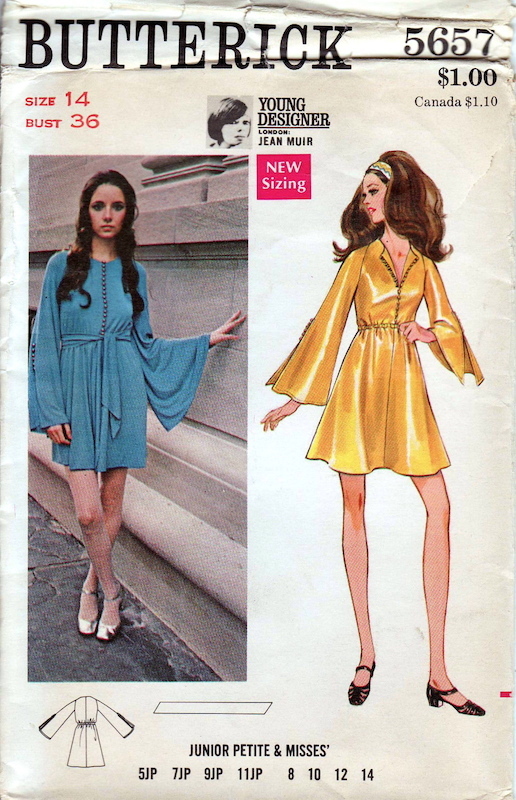 Butterick 5954 by Jean Muir (ca. 1970) Image: PatternVault on Etsy. Chiffon dress and knickers by Jean Muir, Nova, March 1972. Photo: Jeanloup Sieff. Editor: Caroline Baker. Image: Miss Peelpants. Jean Muir dress, British Vogue, January 1971 (1970). Photo: Norman Parkinson. Model: Jan Ward. Image: the National Portrait Gallery, London. 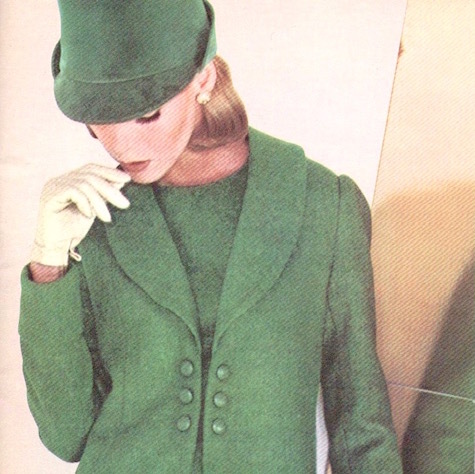 Next: Jean Muir’s Vogue Couturier patterns.